Shhhhhhhh, pretend like I'm not even here. I'm on a blogging break. Technically I'm not even blogging right now. I'm just sharing my Facebook statuses from the week.... 'fess up style. I was reminded of why I started using all-natural Shaklee cleaners when I looked over and saw Brecken with the nozzle IN HIS MOUTH, taking a little sip of the kitchen spray. I was just informed that someone peed in the yard.... I guess spring has officially sprung. Is that a pun of some kind? Found a live ladybug in my organic salad mix. I'm not sure how to feel about this: Happy to see proof that they are not using pesticides, or dismayed that I may or may not have eaten several ladybugs already because I wasn't on the lookout. Fun fact: Greyson just told me "For some reason it looks like you're going to have a baby. You should probably work out more." First time sitting in the hot sun this year, and I am not a lovely golden brown. After a 2.5 hour little league game, I am like a red and white zebra, but only on my face, my arms, and my feet. Awesome. Did you hear? Jesus is coming back on Saturday! Sure glad that guy on the corner was holding that sign or I would have been totally surprised. So that was my week in a nutshell. How bout you? Anything interesting, funny, or embarrassing happen in your life? 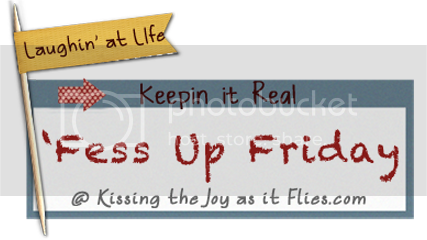 Tell me about it in the comments; OR better yet, write your own 'Fess Up Friday post and link up with me! I would love to come visit your blog. Definitely a pun in there somewhere.. :). And don't worry, I've put my keys in my refrigerator far more times than I'm willing to admit! I am SO GLAD you guys use that stuff! Ethan once did that with a bottle of Windex. The good news is that I had Poison Control on speed dial at that time and they said he'd be ok if it was just one squirt. Also, I'm totally checking out that Shaklee stuff. I love the "for some reason" like he just isn't quite sure what to make of the situation but still feels compelled to mention it to you:). Good stuff as always friend, thanks for the smiles while I lay in bed:). You are so stinking cute - hope you continue to post on your break.